With style and personality as unique as her designs, industrial designer Kickie Chudikova is on a mission to change the world – one product at a time. For Kickie, choosing a career path was simple – she’s always known that she wanted to create and reinvent products. But, it was her time in Vienna at the University of Applied Arts that really shaped her and gave her the vision she has today. 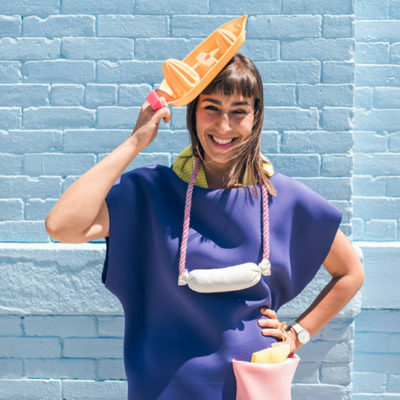 Now, living in New York, Kickie works at Karim Rashid’s studio and runs her own design business alongside her 9-5. Here, she tells us why she wants to create designs that significantly improve our world, reveals her desert island object and shares her unique and amazing opinion on business cards. You describe your work as ‘Function balanced by beauty’ – what does this mean? Throughout our lives, we surround ourselves with objects. We buy what we need, which is the function, but make a mostly subconscious choice based on attraction, which is the beauty. Products need to work well but also appeal to us aesthetically – the balance is the transition from useful to beautiful. Having said that, beauty is not only shape, colour, material and finish – it’s also how we interact with an object and the emotional value it brings. Work hard and stay critical towards your work – being able to step back and look at things from a different angle is important. What led you to study industrial design in Vienna? Ever since I was little, I knew I wanted to create and reinvent objects – I just didn’t know it was a profession at the time. My dad was a construction engineer and suggested I should become an architect, but industrial design goes deeper into detail, and that scale suits me much better. I started at the Technical University in Bratislava, and then found out that Hartmut Esslinger (founder of frog design) was leading a studio at the University of Applied Arts in Vienna – I was lucky to be among the 12 people admitted that year! It was such a formative and influential period in my life and really broadened my horizons. It gave me the opportunity to travel too – I did an exchange at the Milan Polytechnic and visited companies like Apple and Google in California. Your designs are focused around reinventing mundane objects or routines, making them fun and enjoyable through the use of product – what inspired this? I look at the world very critically – you have a lot of responsibility as a designer. You make decisions that influence a whole life-cycle. There’s no excuse for being careless when it comes to design and it makes me almost angry if I see a product with obvious flaws. I aim to approach design in a playful and fun way and try to bring a smile to people’s faces or trigger an emotion. I just designed a coffee cup for people with larger noses – it’s shaped to fit your nose inside, so that you don’t need to tilt your head back while drinking. You strive to design objects that significantly improve our world – what’s the one object, design or invention that you couldn’t live without? My desert island item – duct tape – it can fix anything from a hole in your boat to making a new pair of shoes. As well as working on my own designs, I work at Karim Rashid’s studio, which allows me to have a greater impact and work directly on products that are mass produced and sold all over the world. In order to improve the world significantly though, I think you need to reinvent and work on a big scale. Take Elon Musk and the work he’s doing with SolarCity, Tesla, and SpaceX as an example. He’s able to challenge paradigms and remodel whole systems at pace in order to make our world better. That’s the next step for me. Is there a routine or object that you’d like to reinvent that you’ve not yet created? I’ve lived in NYC for 3 years now and I’m continuously shocked by the crazy amount of trash lying on the streets. It is very difficult to recycle here, and a lot of people just don’t seem to care – or perhaps aren’t informed. Pollution is a design choice – we need to educate and push our clients to use sustainable materials, make objects recyclable and use less so that we don’t add more trash to this world. So, this would be one of the burning issues I’d like to address in the very near future. Your designs are all 3D, tangible objects. How do you get this across in 2D form on your website and business cards for example? I find photography, renderings and video are the strongest way to communicate my ideas in 2D. Having a business card is like having a watch on your wrist – you need to have a really cool one! Thanks to MOO’s Printfinity feature, I can print a different design onto the back of every Luxe Business Card allowing me to match the right card to each prospective client. I have a “Gesamtkunstwerk” or “total work of art” approach to my designs, and consider myself the impersonification of my brand. Designing my own clothes, 3D printing my jewelry and wearing bright colors is a significant part of me – and my brand. I think pictures can express a lot and that’s why I love having business cards. For example, my totem series abstractly represents everything I do in product design – combining textures and shapes and colours to create abstract compositions and form-studies using materials available at reach. All of this on a tiny piece of paper! Other than that, I think Instagram is a really easy and valuable way to promote your work and brand nowadays. Work hard and stay critical towards your work – being able to step back and look at things from a different angle is important. Know the direction you’re going in, so that you can get there even if it takes time. I also think that networking can be the key to success. You can be really exceptional at what you do, but it all comes down to who you know and who you can work with, so meet people and show up. But most importantly, make sure to have fun!